The content below does not express the views or opinions of Spend Matters. Visit https://www.amazon.com/b2b/info/amazon-business to learn more. Procurement leaders want their purchasing decisions to be driven by lessons and insights gained from their organization’s order history data. Gone are the days where the post-purchase data was used only for accounting and reconciliation purposes. With thousands of employees buying on Amazon Business, procurement organizations realize that they can do more with this data. However, to tell a story from their procurement data, organizations will need to invest in business intelligence (BI) engineers, data scientists and dedicated teams of IT personnel. Machine learning (ML) continues to be just a buzzword for these professionals, as they do not yet see the benefits of ML in their everyday decision-making. The Amazon Business Analytics portal provides the tabular order history data by various pivots, including orders, refunds and reconciliation reports. While this acts as a good mechanism to look up specific details about an order, customers told us that they spend multiple hours each month to understand the data and gain insights into the spend patterns of their organization. Customers heavily relied on the CSV download feature to continue to their analysis. They essentially needed to gain BI from their data. To help solve this problem, we partnered with Amazon QuickSight to bring BI to organizations’ Amazon Business order data. Amazon QuickSight is a fast, cloud-powered business intelligence service that makes it easy to deliver insights to everyone in your organization. As a fully managed service, QuickSight lets you easily create and publish interactive dashboards that include ML Insights. Dashboards can then be accessed from any device and embedded into your applications, portals and websites. Spend Visibility, powered by Amazon QuickSight, is a BI tool exclusively available to Business Prime Small, Medium and Enterprise Plan customers. It provides quick access to aggregated charts and visuals based on employee order history data. This enables procurement administrators to gain insights from their employees’ buying patterns, and it empowers them to create policies that will guide the procurement behavior of their employees and eventually their organization. Conversations with numerous procurement professionals surfaced three primary ways in which they wanted to consume their order history data: simple narratives, aggregated charts and tabular raw data. Simple narratives help tell the story of purchasing data in a plain-language narrative. Aggregated visuals provide high-level insights from charts with the ability to find unique patterns and filter for details. Tabular data uncovers the root of the insight by exposing an extra layer of granular information behind each visual. A common request from top management is to understand their organizations’ spending trends. These professionals have neither the time nor the bandwidth to spend hours staring at visuals, drilling down through charts or deciphering rows of data. This problem is only exacerbated as we go up the management chain in any procurement department. By using the recently launched ML Insights feature of Amazon QuickSight, Spend Visibility brings the power of machine learning to procurement professionals. The level of detail you would get with hours of manual analysis can now be embedded contextually within each Spend Visibility dashboard. Authors of Spend Visibility dashboards get a series of machine-generated Suggested Insights presented in simple, natural language. These insights include top month for spending, top category spend and top products purchased. To access Suggested Insights in Spend Visibility, the author of the account simply needs to embed narratives and insights to the dashboards, and then publish for all readers in the organization to see. The bulk of procurement decision makers need more than just simple narratives to learn about the buying patterns of their employees. The out-of-the-box Procurement Dashboard in Spend Visibility provides rich KPIs, charts, drill downs and filtering capabilities, which allow these leaders to just do that. For example, after setting up Guided Buying policies on Amazon Business, procurement professionals need to be able to audit those policies and see how they are impacting actual purchasing behavior. Company compliance with spending and buying policies is just one such visual on the Spend Visibility dashboard. 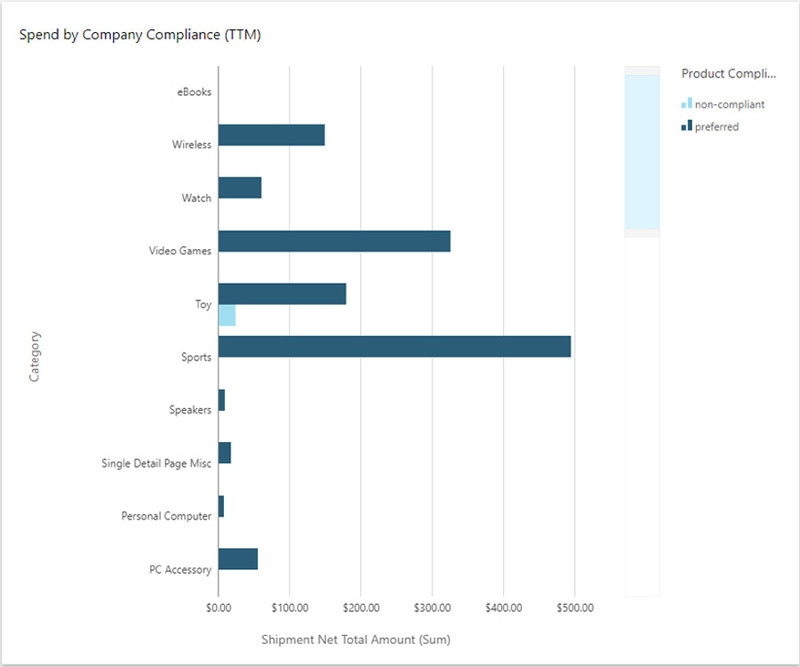 This dashboard provides a horizontal bar graph that shows the amount spent in various categories, and further breaks down the data by preferred and restricted items based on their company’s policies. By using the drill-down feature, you can even identify the employee who made non-compliant purchases and see the exact line items they purchased. Both Spend Visibility authors and readers have instant access to various visuals like these, including Spend by Category, Spend by Users and Spend by Groups. While simple narratives and aggregated visuals are enough to tell the full purchasing story for most, there will always be scenarios where finance or procurement professionals need to dive deep to get to the bottom of an issue. In those situations, they need access to the raw tabular data that drives the visuals and narratives. Spend Visibility helps with the end-to-end investigation of data, allowing users to start from the top, drill into the details and finally access the filtered view of the raw tabular data that is contextually relevant. For those who want to access the raw data used to create the graphs, use the “export to csv” feature at the top right of any Spend Visibility visual. Amazon Business launched Spend Visibility as part of Business Prime in October 2018. Since then, more features have been added to Spend Visibility, such as Calculated Fields, Auto-Narratives with ML Insights and numerous additional attributes, including shipment status, PO number and seller credentials. This helps organizations build custom dashboards for tracking spend with diverse sellers, shipments by seller and lookup by purchase order details. What Spend Visibility dashboards are you going to build? To learn more, visit our Spend Visibility page. This post is sponsored by Amazon Business and is written by Barath Balasubramanian, Principal Product Manager Tech.